To an ant, this thing is HUGE!!!!! So, you might ask, why are tiny little doodle man and his poorly drawn dog so frightened? Why, impending death by giant penny of course. You laugh now, but I’ll bet you’re gonna have a dream tonight where you get crushed by a humongous faux copper effigy of a dead president and it’ll be the scariest dream you’ve ever had! Then who’ll be laughing? Not you, because you’ll be too busy changing your sheets. The Illustration Friday topic for this week is “scale”. I thought of a bathroom scale… I thought of perspective and size relationships… and then I naturally thought of balding snakes. As I’m sure everyone else did, as well. So I started sketching a shoe. And then these guys show up. I’m tellin’ ya….I have got to put out some traps around here. I was watching Dennis Miller’s new sports/talk show on Versus last night (and for those of you who know me, pick your jaws up off the floor. No, I haven’t suddenly and inexplicably become a sports fan. But I am a longtime Miller fan). Someone asked him if he thought Ultimate Fighting would eclipse boxing as the popular combat sport within two years, to which Dennis Miller replied that ultimate fighting was ALREADY more popular than boxing, and that he saw it in turn being eclipsed by death matches between hyenas with dwarves strapped on their backs. Now I ask you, me being a doodler and all, how could I possibly let such a mental picture slip by without doodlin’ the heck out of it? I’m almost positive that would have been against the laws of nature or something. 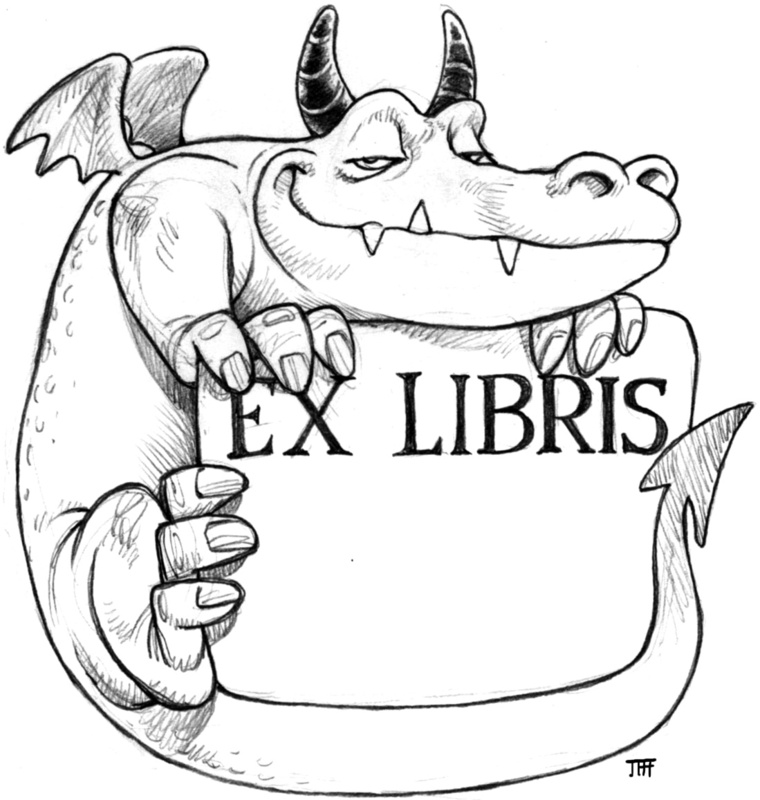 I was enjoying some of the beautiful bookplates (ex libris) on the BibliOdyssey blog, and it dawned on me that- while I have always loved bookplate art- it’s been ages since I created one of my own. After doing so, I started feeling all giddy and generous and such and decided I wanted to share it with everybody else in the blogosphere! So download away, dear reader! I have uploaded a high-res version (click on the thumbnail to get to it) so you’ll have a cleaner printout. All I ask is that you don’t try to re-sell it in any shape, form or fashion, and that you leave my little signature on it. Other than that..feel free to printout 5 billion of them for you and your closest friends. Also, please remember to use only a good acid-free paper and library grade glue to paste it in the front of your books. Hope you like it. Happy reading, everybody. For that extra little boost we all need on Mondays. We all have something…or at least we did as kids….that made us feel like we were stronger than King Kong or prettier than Barbie (or both maybe). My childhood “invincibility totem” was my first pair of real live hiking boots. I felt like I was ready to hike up Everest with those bad boys on! Yours might have been a certain pair of sneakers, or your first leather jacket, or a special dress. Or maybe it wasn’t an item of clothing. Maybe it was a person. That best friend that was dead set on y’all being a crime fighting team when you grew up. Or the sister you were going to form a world-famous rock band with. Nowadays, mine is a beautiful woman named Kristi. Ten years ago tomorrow, she said she’d marry me. And ever since-with a huge heap of God’s help in the mix-we’ve climbed personal and emotional mountains together that make ol’ Everest look like a cake walk. And I’m ready to take on more every time I look at her. So….what about you? What makes, or made, you feel invincible?